If your free video downloader only downloads video from one or several video sites, ditch it away. You deserve a better video downloader. Actually, in some aspects, the current free online video downloader does a great job, even better than your professional video downloader software. They makes even easier work of free downloading video from YouTube, Vimeo, Vevo, etc. Even the free online video downloaders suffer from the pain of natural selection. Only the fittest survive and serve for you. The winners are clipconverter and keepvid. The following part will compare free online video downloaders clipconverter and keepvid with free video downloader software MacX YouTube Downloader to show their own pros and cons for your referene if you just happen to make a decision on free video downloader. FREE download video from YouTube, Vimeo, Facebook, Vevo, etc. 300+ sites. * Free download video 720p, 1080p, 4K, 8K from YouTube. * Support YouTube, FB, Dailymotion, Instagram, Soundcloud, etc.300+ sites. * Multi-core CPU utility takes the most advantage of CPU to video download. * Trim, crop, rotate videos; add external subtitles to videos; adjust parameters. Clipconverter delivers on its basic promises: free download videos and convert videos. It does so in a manner that is simple and fast. Only 4 steps to finish both the online video downloading and conversion procedure. But it's limited to YouTube and Vimeo services currently. So for those who are looking for free download videos from Facebook, Vevo, etc. other sites, look somewhere else and resort to ClipConverter alternative. This free online video downloader wins a wide wave of popularity because of its simplicity, fast speed and multiple functions. No need to download anything, you can directly free download YouTube video and Vimeo video after pasting the video URL to its site. If the original video format is not the one you desire, you can select the output format from its "Conversion Format" section, with MP3, M4A, AAC, MP4, 3GP, AVI, MOV, MKV, 8 output formats to choose from. Step 1: Paste the video URL to the analyze box and click "Continue". Step 2: Select the format (up to 8) and the options for the conversion. The default options are for most videos a good setting. Step 3: Hit the 'Start' button at the bottom to start video conversion. Step 4: Download the converted video file after several mins video conversion. The video URL analysis is responsive and fast. Supports converting video to 3 audio and 5 widely used video formats. No need to install plug-ins or third party applications. Only 2 video sharing sites supported. Other famous sites like Vevo, Myspace, Facebook, etc. not supported. Clipconverter is not available for video containing music. 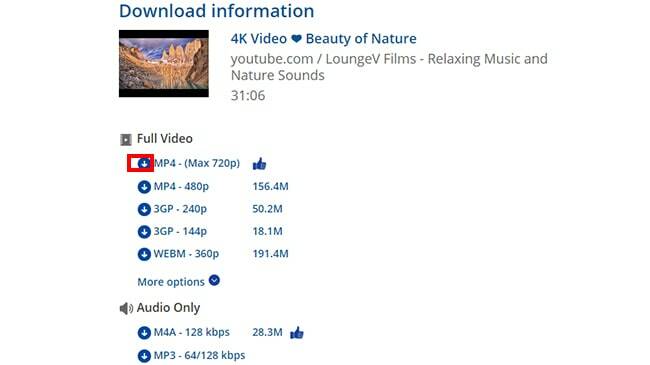 File size is too large 5GB for 30-min long video when it comes to download 4K video. Not available to use for free downloading 8K UHD videos. Keepvid comes to rescue you if you think Clipconverter supported video sites are too limited. This free online video downloader service allows you to free download video from YouTube, Facebook, Vimeo, etc. 28 video sites (No 4K video). And if you wanna free download videos from more video sites and convert downloaded videos, its advanced pro version is avaliable for you. Of course, you need to pay for the more features. Keepvid is simple and efficient. It offers you the exact feature you need: download video from most widely used video sites. Though not all the video sites supported, it enables you to free download video from YouTube, Vimeo, Vevo, Facebook, etc. and it keeps updating to embrace more video services. The only downside if I must mention is that it can't help you download 4K Ultra HD video from YouTube or other sites. The maximum resolution is only up to 720p. Step 1: enter the video URL to the analyze box and click "Download". Step 2: Select video and audio format from its pop-up window. Video maximum resolution is up to 720p and audio maximum quality is up to 128kbps. Step 3: Click the download icon before the video format and then the video download task goes into action. Free online video downloading process is simple for both newbies and experts. Online video sites up to 28, more than Clipconverter. No third party apps, no spyware/malware, etc. The annoying commercial ads on the website can't be closed. Not support 4K video downloading, let alone 8K UHD video downloading. Audio quality supports up to 128kbps, no 256kbps option. Unlike Clipconverter limited video sites support or Keepvid 4k video downloading failure, the cutting-edge MacX YouTube Downloader allows you to free download video from YouTube, Vimeo, Facebook, Instagram, Dailymotion, Vevo, etc. 300+ sites with whatever video format and resolution. With hyper-threading tech and multi-core CPU utility, this online video downloader software makes ultra HD 4K or 8K video downloading possible. The multi-core CPU utility can assign the whole video downloading task to up to 8 CPU cores, which means the video downloading task can be finished simultaneously by 8 CPU cores, 800% faster than single one CPU. Thus, when you free download 4K, 8K, 1080p or 720p video, you can find there is no block to your network speed. Summary: You may easily draw an conclusion that MacX YouTube Downloader is the best online video downloader you can rely on which is more efficient and comprehensive than those free online video downloaders from any site. Now comes to the question: How to download online videos from any site easily with high quality? Will it be a hard process? Don't worry, you can download videos from website like YouTube with few simple steps below. Before you go, make sure that you've downloaded free online video downloader from any site on your Mac. Step 1: Free download this online video downloader, run it and hit "YouTube" button. Click "YouTube" button, copy and paste the video URL to the type box. Step 2: Choose an output format. You are free to choose video format, resolution and file size. Step 4: Hit "RUN" to start to download video from Vimeo, YouTube, Instagram, Vevo, etc. on Mac. After you free download your wanted video from any site, you may also want to transfer the downloaded videos or movies to mobile devices for playback freely. In this case, the higher version of the above online video downloader MacX Video Converter Pro will be what you need. As a matter of fact, this pro serves as both an online video downloader and converter, which is able to free download videos from any site and convert the downloaded videos into various popular formats like MOV, MP4, AVI, WMV, MP3 etc with extremely high quality or directly to mobile devices, like iPhone XS/XR/X/8/7/Plus/6s/SE, iPad Pro, iPad Air, iPad Mini with Retina display, Samsung Galaxy, HTC 10, Surface Pro 4, Google Pixel, Nokia, Huawei, etc. Tired of struggling to watch YouTube videos with ads and buffering? Why not watch YouTube offline? Here is the guide of how to watch YouTube videos offline on Mac iPhone iPad and Android devices. This guide focuses on the top three free movie downloaders for Mac El Capitan, recommending for the best movie downloader for Mac on the basis of the comparison of the three free movie downloaders for Mac OS X 10.11 El Capitan. MacX Video Converter Pro is a feature-rich, high quality, and incredibly fast video game recorder for Mac. It's an all-in-one video converting solution with top quality, easiness, fast speed and high-efficiency.